You’re out of college, but you still appreciate the taste and convenience of your favorite university staples. Working long hours at your first “real” job can feel like pulling an all-nighter to cram for midterms, which makes prepared food a great timesaver. It’s also easy to reach for when you don't know what to make for dinner and you haven't quite mastered the art of the crock pot. In addition, stocking up on microwavable or just-add-water meals is a lot cheaper than takeout because, let’s face it, entry-level salaries usually don’t come with much disposable income. But while your new adult self still leans on college habits, you’ve probably realized you can’t get away with ingesting large quantities of junk food forever. Luckily, it’s easy to make alterations to your favorite packaged meals to make them yummier, healthier, and more filling. 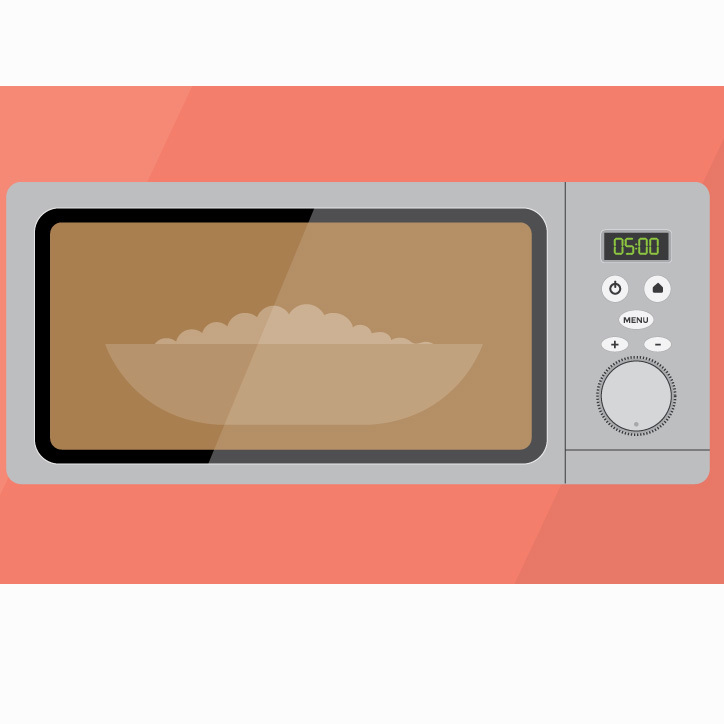 Try these healthy hacks to make your favorite dorm food suitable for the adult world. On its own, a package of ramen noodles has a ton of sodium and little nutritional value. Instead, just pour in half of the seasoning packet or skip it altogether. You can season your noodles with spices and sauces you already have on hand, such as salt, red or black pepper, and soy sauce. If your cupboard is well stocked, try cumin, turmeric, or curry powder. Keep a bunch of green onions in your refrigerator – they’re inexpensive, and it’s easy to chop one or two stalks for added flavor. You can even plant them on your windowsill to keep your supply growing! Next, add your favorite protein and veggies for a serving of vitamins. Before you decide it’s too much work, remember that you can buy pre-chopped meats and vegetarian proteins. There are also frozen options, such as shrimp, so you don’t have to worry about using all your supply in the same week. If you buy pre-chopped protein, just throw it in a pan with some olive oil and sauté until cooked. Of course, frozen protein will need to de-thaw in your refrigerator while you’re at work. Add the same spices and sauces to your protein that you used on the noodles. A scrambled egg is also a great addition, or it works fine on its own as a protein source. You could stop there, or you can also add a vegetable or two. Like pre-chopped meats, most stores sell fresh and frozen stir-fry veggie mixes. If that’s too expensive, grab a carrot and grate it onto your bowl of ramen. If you want to get fancy, try baby bok choy. Frozen peas also make an easy, inexpensive addition. Just be sure to thaw the frozen vegetables in a colander under running hot water for a few minutes. Otherwise, your sauté pan may get watery. No matter which proteins and vegetables you choose, you now have a delicious, nutritious ramen stew. 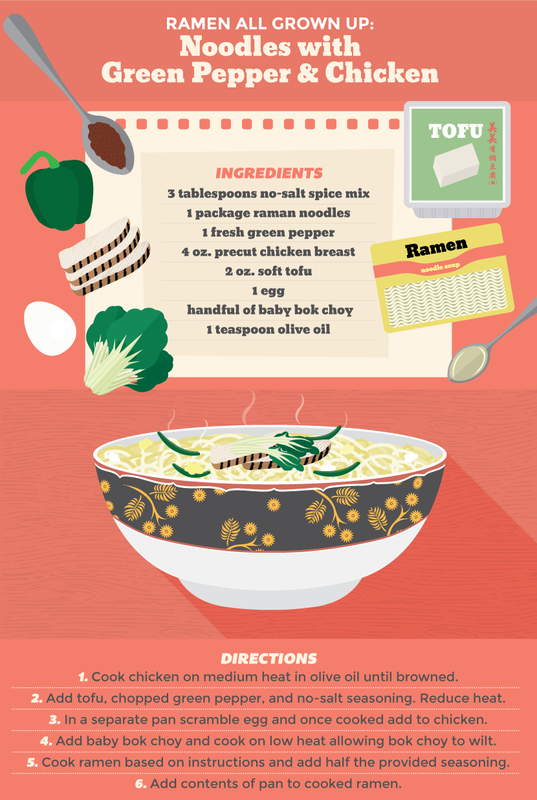 For one more ramen hack, experiment with different brands of noodles, particularly ones that are a little more expensive than the 25¢/bag kind you relied on in school. When I studied abroad in France, I was particularly fond of a brand of duck-flavored ramen. This iconic yellow pasta is a favorite food for kids from 1 to 100. Like ramen, mac and cheese is a perfect comfort food on its own, but it’s also high in sodium and it contains virtually zero nutritional benefits. However, Kraft, which makes the most famous brand of mac and cheese, is is removing artificial coloring from its recipe. That’s one step in the right direction; here are some others you can take on your own. Stir in just half the provided cheese powder and all the milk the box calls for. If you’re not watching your fat intake, try whole milk for a creamier consistency. You could also add real shredded cheddar cheese instead of or in addition to the powdered stuff. It’ll melt on contact and give your mac a richer flavor, not to mention a healthy combination of calcium, protein, and B12, among other vitamins. If you hack your mac with real cheese, you’ve already given yourself protein and vitamins. Anything else you add will only increase the nutritional brew or give you variety if you eat mac and cheese more than once a week. 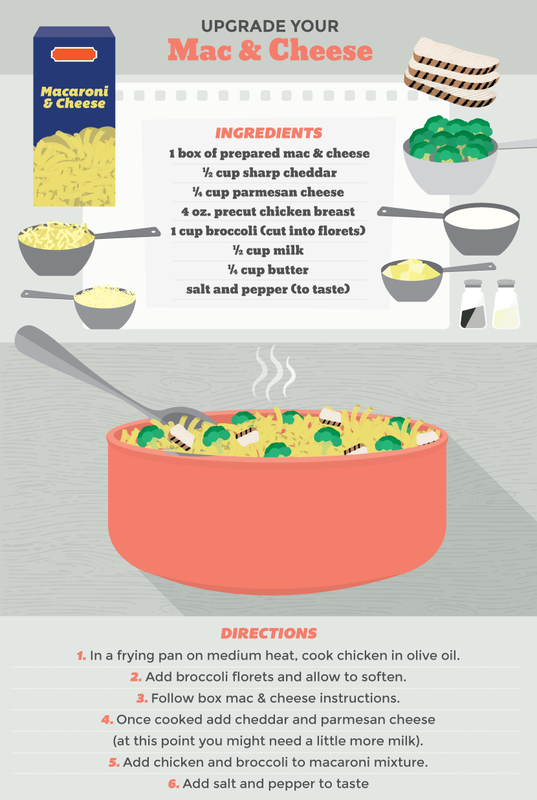 Try your mac with chopped chicken for the poor man’s version of fettuccine linguine. Vegetarians can add soy “chicken” strips. For a veggie-centric twist on another popular pasta dish, throw in peas, broccoli florets, carrots, or any other vegetable you like. Voila – now you have mac and cheese primavera. If you’re looking for a premade rice dish that only requires hot water or a microwave, there are even more options than those available for ramen. But just as with ramen and mac, you run the risk of consuming unhealthy quantities of salt, sugar, and preservatives. Again, skip the flavor packet or only use half of it and add your own protein and veggies. You can also easily make your own rice at home with a rice cooker. First, decide which kind of rice you want to eat. White rice cooks faster at home, and it’s the predominant type of rice you’ll find in premade boxes and bowls, but brown rice is a whole grain, which means it will keep you full longer and won’t send a jolt of sugar into your system. If you make your rice at home, try brown rice. It’s just as easy to cook, and it only takes a little bit longer. Skip the seasoning packet and use the spices you already have at home. Even a sprinkle of salt and pepper will suffice, and you’ll add a lot less sodium than the amount in the pre-made seasoning. You could also read the ingredients and re-create the seasoning on your own without the preservatives or whopping dose of salt. Rice complements all kinds of protein, including beef, chicken, pork, seafood, tofu, and other vegetarian substitutes. As you cook the protein of your choice, add soy sauce or any other suitable marinades you have on hand. If you don’t have meat on hand, another quick way to add some protein is to top your rice with a fried egg. I love keeping the yolk runny so I can mix it in with my rice. Some rice meals come with vegetables, but you can easily add anything you have in your freezer. Think of the fried rice you buy at the corner takeout joint. Peas, carrots, onions, mushrooms, and string beans are also classic additions. I like to put a southwestern spin on my rice dishes and add some cubed avocado. While the possibilities are endless, there will still be days when you don’t have the money or the energy to go beyond the package instructions, but every little bit helps. Whether it’s a sprinkle of real cheese, a bag of frozen peas, or a package of pre-chopped chicken, it’s easy to upgrade your favorite comfort foods into flavorful, healthy adult meals.